This is the eighteenth in the series on the Presidents of EWGS leading up to the 75th anniversary in 2010. See the previous posts on Samuel Pool Weaver, Leora Cookingham Thiel, Susan Marie West Jack, Ruth Churchill Austin, Alfred Denman, Florence Ballou Brown, Harriet Jefferson Pinkham, Mary Elizabeth Dow Maltbie, Achsah Maltbie Rawlings, Lee DeGolyer Patchen, Susie Elliott Faubion, Edith Webb Nelson, Carrie Teats Lartigue' Guy Alfred Clumpner, Grace Ellis Woodward, Mabel Rue Frederick and Nell Hartman Peel. Edwin Allan Poole was EWGS President in 1964. Edwin was born at Kaukauna, Outagamie County, Wisconsin, son of Edwin Franklin and Kathleen (Allan) Poole. In the Presbyterian church in Bison, Perkins County, South Dakota he married Gladys Thomte. She was born at Liston, North Dakota, daughter of John and Mary Louise (Paquin) Thomte. Ed was a school superintendent in South Dakota and then Sales Manager for Prudential Life Insurance in Spokane till he retired in 1968. As I said in the last article on Nell Peel, Ed started the first EWGS bulletin in June of 1963, called Tree Talks. After three issues it became News Notes for about a year when it was called The Messenger for about three years. Then no name for a couple of years and in 1969 it became The Bulletin. Ed also wrote a nice five page article in The Bulletin in 1975 titled "The First Forty Years". One of the interesting paragraphs he wrote was: " There were many times in the past when books and money were contributed by the Society or its members. At one time $50 was given when that amount bought a lot more than it does now. Mrs. J. Fred Austin (the fourth EWGS president) and Mrs. Walter E. Fredrick (also an EWGS president) made several cash donations and often quietly added books to the library. In the 1940s when the library was considering the contract purchase of the costly vital records of the 70 Massachusetts towns, Mrs. Austin volunteered to donate $25 a year until the books were paid for. There are probably many others who like these fine ladies did much for the growing Society and the library." Another interesting fact Ed wrote about was at the first meeting of EWGS they decided to hold the meetings on the first Saturday of the month which is still true today. Edwin died October 28, 1975 in Spokane and was buried at Fairmount Cemetery. 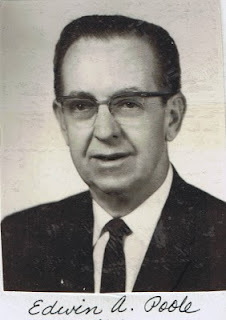 He was a member of the Spokane Amateur Movie Club, Eastern Washington Genealogical Society, The Westerners Historical Society, the Huguenot Society of Washington State, Eastern Washington Historical Society and Audubon Park Masonic Lodge 272. He was survived by his wife Gladys and daughter Carmen Farley. Gladys Poole was a school teacher, and worked as a chemist for Alcoa Aluminum during the war. She died in December 2000 and her obit appeared in the Spokesman review December 29, 2000. She helped author the book Genealogy and Family History of John Pool(e), 1630-1981. 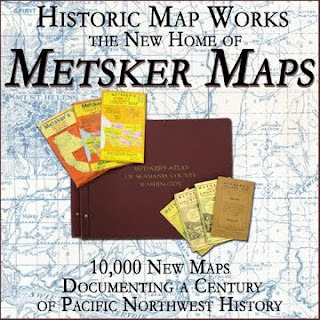 During their almost century long run, the Metsker family produced approximately 300 county atlases and 400 county wall maps of Washington State, Oregon, Idaho, and Northern California. Scanning the newly acquired maps will add approximately 10,000 images to the 1.2 million map related images already available on www.HistoricMapWorks.com. You can read more about these historic maps and see examples of our first scans from the new collection here. It was brought to my attention that the air times and dates for Faces of America were incorrect in my last post. I have changed them and they are correct to the best of my knowledge. Additional information on BYU-TV's channels has also been added. If you haven't already heard, there are three genealogy televisions shows either currently broadcasting or soon to be! The first one is The Generations Project, which first aired January 4, 2010 on BYU-TV. This is "a new reality series that helps those who have questions about their family history investigate their own identities by walking in the shoes of their ancestors. As they undertake these journeys, they often uncover the hidden identities in family pasts, and come to see that in many cases the best way to know who you are is to know who you came from." Ordinary people are featured on this program, rather than celebrities. In the Spokane area, you can watch this show on Channel 232 on Comcast Cable and Channel 9403 on Dish Network. The Generations Project is aired four times during the week so check your listings. You can also watch the most current episode on their website at http://www.byub.org/thegenerationsproject/. Older episodes will be available to view online starting in April. The second show also has already begun airing. This is Faces of America, a four-part series hosted by Henry Louis Gates, Jr. on PBS.Our local television station, KSPS, threw a bit of a monkey wrench into things when they aired the first episode last Wednesday at 7 PM, instead of 8 PM as it was nationally advertised. The subsequent three episodes will also air at 7 PM on Wednesday nights from February 17th through March 3rd. In this show, Gates "turns to the latest tools of genealogy and genetics to explore the family histories of 12 renowned Americans — professor and poet Elizabeth Alexander, chef Mario Batali, comedian Stephen Colbert, novelist Louise Erdrich, journalist Malcolm Gladwell, actress Eva Longoria, musician Yo-Yo Ma, director Mike Nichols, Her Majesty Queen Noor, television host/heart surgeon Dr. Mehmet Oz, actress Meryl Streep, and figure skater Kristi Yamaguchi." Previously aired episodes will be available to watch online every Thursday following the airing at http://www.pbs.org/wnet/facesofamerica/. 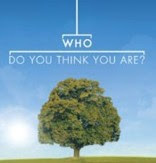 And last, but certainly not least, the American version of the British and Canadian genealogy reality series, Who Do You Think You Are? will begin broadcasting on NBC on Friday, March 5th! Seven celebrities (Matthew Broderick, Lisa Kudrow, Spike Lee, Sarah Jessica Parker, Susan Sarandon, Brooke Shields and Emmitt Smith) embark on the journeys of their lives--the quest to discover the genealogical roots of who they are. If the show does well this spring, it is hoped that it will renew for the fall! You can read more about it here. This is the seventeenth in the series on the Presidents of EWGS leading up to the 75th anniversary in 2010. See the previous posts on Samuel Pool Weaver, Leora Cookingham Thiel, Susan Marie West Jack, Ruth Churchill Austin, Alfred Denman, Florence Ballou Brown, Harriet Jefferson Pinkham, Mary Elizabeth Dow Maltbie and Achsah Maltbie Rawlings, Lee DeGolyer Patchen, Susie Elliott Faubion, Edith Webb Nelson, Carrie Teats Lartigue and Guy Alfred Clumpner, Grace Ellis Woodward and Mabel Rue Frederick. In 1961 the next EWGS President was Lee Patchen again, so I will go on to Nell Hartman Peel the 1962 and 1963 EWGS President. 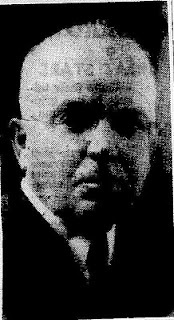 Did not find much on Nell, she appears in the Spokane City directories in the 1920s, and married Samuel E. Peel June 18, 1932 in Stevens County. I did not find much on Samuel either, he was living in Spokane in the 1920 census age 53 born in Canada. In 1930 I found Nell here in Spokane in a boarding house age 40, but no Samuel. After they married I did not find them again. In the 1940 city directory Nell is back, working for the school district as a clerk, and after that either a clerk or a teacher, but no Samuel, so maybe he went back to Canada?? Nell did leave Spokane to live in Rockford, Illinois, and passed away at Rockford January 29, 1985. Probably the highlight of her time as EWGS President was the first bulletin. The first publication was in June of 1963, by Edwin A. Poole (more on him later). It began as a one page publication called TREE TALKS. After three issues it became NEWS NOTES for about a year when it was called the MESSENGER for approximately three years. Then no name until 1969 when it was named THE BULLETIN which continues on to today. Copies of all those issues are in the periodical section of the genealogical section of the Spokane Library, and many of the issues have been indexed by Google Books. If you live in the Spokane area, Miriam Robbins Midkiff would like to invite you to take her Intermediate Online Genealogy Course, available through the Community Colleges of Spokane's Institute for Extended Learning (IEL). Classes will be held Tuesday evenings from 6:00 to 8:00 PM for six weeks at the CenterPlace campus, 2426 N. Discovery Way, Spokane Valley, Washington. Mrs. Harders, unknown location, to Rena Lerfald, postcard, c. 1909 - 1913, unpostmarked; Lerfald-Westaby Postcard Collection; privately held by Troy Midkiff, [ADDRESS FOR PRIVATE USE,] Vancouver, Washington, 2010. Happy Valentine's Day! There are some very special Valentine treats that have been put together by the genealogical community! 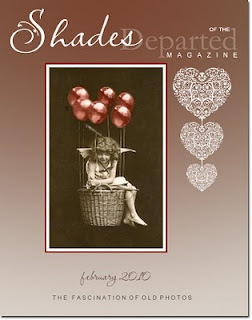 The first one is the Valentine's edition of Shades of the Departed, the beautiful and incomparable genealogy, history, and photography e-magazine! Oh, and I did I mention, it's free? True to their quality standards, the writing and editorial team headed by the footnoteMaven have put together a fabulous issue featuring vintage African-American photos (this is African-American history month, after all! ), a sweet fiction piece, an article on what the archival process involves, and much, much more! Plus, it's just so fun to actually turn the pages of this online magazine--go check it out, if you haven't done so--and you can download it for reading again later! The next treat is from another one of my favorite people, Lisa Louise Cooke. She recently had the privilege of interviewing Lisa Kudrow, with whom you will be familiar from the television show, Friends. If you haven't already heard, Ms. Kudrow is the executive producer of a new genealogy show airing on NBC March 5th, Who Do You Think You Are? Lisa C. interviewed Lisa K. in her latest episode of the Genealogy Gems podcast, which is available to listen to today. Now if you've never listened to a podcast, don't be intimidated! You don't need an iPod, an MP3 player or any fancy technological equipment. All you need is the computer you're using right now to read this, and either speakers or headphones. Go to this link and look at the little white podcast player in the right-hand column. Click on the play button ( > ) and listen to this fascinating and exclusive interview! 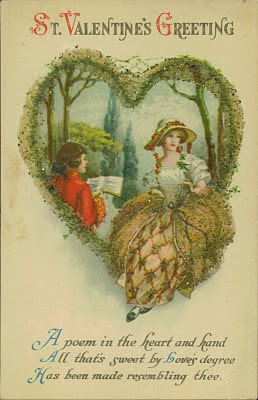 A genealogical Valentine magazine and radio show...or at least the modern versions of such...it doesn't get any better than this! Happy Valentine's Day! If you are a Legacy Family Tree genealogy software user, or are simply curious about this genealogy software program, you may be interested in the Legacy Users Group (LUG), which will meet next Wednesday, February 17th, from 1:30 to 3:30 PM in the meeting room of the Shadle Park Branch of the Spokane Public Library at 2111 W. Wellesley. Regular attendees will take turns in the role of moderator for each meeting. If you have more questions, please contact Donna Potter Phillips here. This is the sixteenth in the series on the Presidents of EWGS leading up to the 75th anniversary in 2010. See the previous posts on Samuel Pool Weaver, Leora Cookingham Thiel, Susan Marie West Jack, Ruth Churchill Austin, Alfred Denman, Florence Ballou Brown, Harriet Jefferson Pinkham, Mary Elizabeth Dow Maltbie and Achsah Maltbie Rawlings, Lee DeGolyer Patchen, Susie Elliott Faubion, Edith Webb Nelson, Carrie Teats Lartigue and Guy Alfred Clumpner and Grace Ellis Woodward. 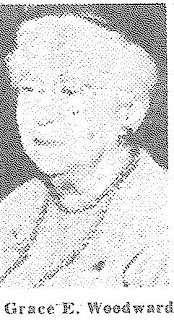 Mabel Rue Frederick was Second Vice President in 1958, and became president after the untimely deaths of Guy Alfred Clumpner and Grace Ellis Woodward. She also was president in 1959 and 1960 and so became the longest serving president of EWGS. She was born in Spokane at the home of her grandfather Col. David P. Jenkins, August 19, 1885. Col. David P. Jenkins was a lawyer and he was the first settler on the north side of the Spokane River when he came to Spokane June 3, 1979 from Illinois. Col. Jenkins was born in Mt. Pleasant, Ohio in 1823. Practiced law in Illinois, was a friend of Abraham Lincoln, a Civil War Colonel for the Illinois Volunteers. He started the Spokane University, donated the land for the Spokane Courthouse, built a getaway cabin in Stevens county (Jenkins High School is named for him), refused to give land to James J. Hill for the Great Northern Railroad, but sold the land where the present day Kendall Yards is located to the city leaders who then gave that land to the railroad. As a note Spokane University was located south of the courthouse, but did not last long, but the street in front of the University was named College Avenue, and that name survives to today. Mabel's grandfather Lewis Rue was from New Jersey. 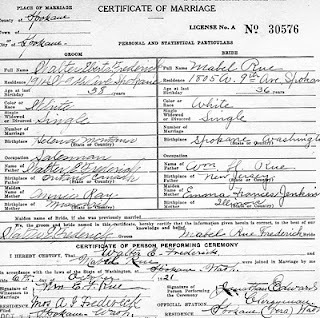 Mabel married October 6, 1921 in Spokane, Walter Eberts Frederick (1882-1936) born at Helena Montana and died here in Spokane June 1936. He was an office supply clerk for Shaw-Borden printing company. Mabel was a charter member of Spokane Garry Chapter of the Daughters of the American Revolution and was named Woman Pioneer of the Year in Spokane in May of 1975. Mabel died in Salt Lake City January 19, 1980 and is buried at Fairmount Cemetery. Comments by Carrie Lartigue: Mrs. Walter E. Frederick. Mabel was the granddaughter of early Spokanite - Col. Jenkins. He donated the land on which our Spokane County Courthouse stands. Mabel was a dedicated genealogist and active in the Daughters of American Revolution. Mabel moved to be near her Doctor son in Salt Lake City in her later years. She gave me some clothes worn by her grandmother in 1848 before the Civil War. A neat treasure for me! Hamburg, Germany, London, UK and Tel Aviv, Israel – February 3, 2010 – MyHeritage.com, the company that connects families to their past and to one another, today announced a significant expansion of its global family network through the acquisition of the Hamburg-based OSN Group, which operates a network of 10 market-leading family sites, including Verwandt.de (Germany), Moikrewni.pl (Poland) and Dynastree.com (USA). “MyHeritage.com has established itself as the trusted home for families on the web. By integrating these market-leading services into a single international platform, we are taking a great step towards realizing our vision of connecting families around the world,” said Gilad Japhet, founder and CEO of MyHeritage.com and the father of three children. “We’re thrilled to welcome millions of new families from some of the Internet’s most important markets to our platform. We look forward to offering our new members an effortless migration which preserves their privacy, and we will deliver the best that our combined network and technologies can offer to support them in exploring their family history, sharing important memories and staying connected”. MyHeritage.com now holds a formidable international registered member base of 47 million, and offers its services in 35 languages. The acquisition helps MyHeritage.com build on its existing strength in the USA, UK, Canada, France and Australia while making significant inroads into key European markets such as Germany, Poland and the Netherlands as well as many major Latin American markets. Combining these services into a single international platform expands the size of MyHeritage.com’s unique user-generated family graph to 13 million family trees including 530 million genealogical profiles. The increased scale of this privacy-enforced family graph provides instant value to families, making it even easier for them to find long-lost relatives and discover more about their unique family histories. This will help, for example more North American members connect with their European relatives and ancestors. As part of the acquisition, MyHeritage.com will be establishing an office in Hamburg where experienced OSN team members will be based. New technologies from OSN will be integrated into MyHeritage.com, starting with the Family Crest Builder, which will go live on MyHeritage.com this week. "We’re really excited to be able to combine the best of OSN and MyHeritage.com’s services to bring even more value to our members” said Daniel Grözinger, co-founder of OSN Online Social Networking GmbH. "Since 2007, we have built our services into market leaders in key European and Latin American markets and we’re excited to work with Gilad and his team to make it easier for families to keep in touch and bridge gaps of geography, language and time. Our members' family trees are now safely and securely migrated to MyHeritage.com where they can continue to enjoy the service for free and benefit from many additional features of the combined platform, such as Smart Matching and photo tagging technologies". MyHeritage.com was founded by a team of people who combine their passion for family history with the development of innovative technology. Since launching in November 2005 MyHeritage.com has become the world’s leading international online network for families and the second largest family history website. The fastest growth rates in the industry combined with the acquisitions of Pearl Street Software (2007), Kindo.com (2008) and OSN (2009) have made MyHeritage.com the home for 47 million family members and 530 million profiles. The company has offices in London, UK; Hamburg, Germany; Boulder, Colorado, USA and Tel Aviv, Israel. MyHeritage.com has received funding by Accel Partners and Index Ventures. For more information, visit www.myheritage.com. Lindon, UT – February 4, 2010 – Today Footnote.com announced a major addition to its Vietnam War Collection: Army Photos and Unit Service Awards. Now totaling over 100,000 photos and documents, this collection helps visitors gain a better perspective and appreciation for this often misunderstood event in U.S. History. The Army Photos feature various activities of the U.S. Army during the Vietnam War. In nearly every case there is a caption or description of what was happening and the names of the soldiers featured in the photos. Everything ranging from daily duties to Bob Hope’s Christmas program is captured, providing a glimpse into what life was like for the soldiers. Footnote.com will continue to work with the National Archives to add more Vietnam War content online. The Vietnam War Collection will be made free to the public during the month of February. To view these documents, visit www.footnote.com/vietnam. This is the fifteenth in the series on the Presidents of EWGS leading up to the 75th anniversary in 2010. See the previous posts on Samuel Pool Weaver, Leora Cookingham Thiel, Susan Marie West Jack, Ruth Churchill Austin, Alfred Denman, Florence Ballou Brown, Harriet Jefferson Pinkham, Mary Elizabeth Dow Maltbie and Achsah Maltbie Rawlings, Lee DeGolyer Patchen, Susie Elliott Faubion, Edith Webb Nelson, Carrie Teats Lartigue and Guy Alfred Clumpner. Grace Estine Ellis was born August 25, 1879 in Dayton, Washington the ninth child of Samuel George Ellis (1832-1904) and Rhoda Ann Kennedy Ellis (1836-1904). Samuel was born in Virginia and was a Pioneer of Walla Walla in 1862. Rhoda was born in East Tennessee and died in Spokane. Her family was from Ireland. Rhoda's father John K. Kennedy was the captain of the wagon train to Walla Walla and the Ellis family came by ox team. Grace was selected to be EWGS President after the untimely death of Guy Alfred Clumpner in April of 1958, and she also died before her term ended, July 9, 1958. She was cremated. Grace had joined EWGS in 1953 and was also a member of Electra Chapter of OES and the Daughters of Pioneers. Grace married Dan Marshall Woodward September 30, 1900 here in Spokane. Dan was the son of Henry and Margaret (Thompson) Woodward. Dan was born on the family homestead in Winona, Minnesota, still owned by the family, April 15, 1863 and he died here in Spokane June 8, 1937. He was the department manager of books and stationary for John W. Graham and was recognized as the leading athority in the west on fine paper. The 1929 Spokane City Directory has an add from the John W. Graham & Co. Office Supplies, Office Desks, Chairs and Filing Equipment. 707-711 Sprague and 708-716 First Avenue, Spokane, Washington.